The Jazz looked dead after a dispiriting road loss to Dallas two Sundays ago, and it’s tempting to write them off again after their defense no-showed (or, alternatively, showed up in its usual form) last night against a very enthusiastic Denver team missing its best player. But it’s too early to declare the Jazz dead. The most sophisticated playoff odds predictors have them somewhere between a 50/50 shot and 35/65 underdog to overtake the Lakers for the no. 8 spot. Utah is one game back of L.A. in the loss column, and a half-game back overall, but the Jazz, as you surely know, own the tiebreaker over L.A. They’ve also got a workable remaining schedule — three games against lottery teams and three against postseason teams, with two of those toughies coming on the road. The finale is in Memphis, and that brings us to a huge wild card in the Jazz/Lakers race: the unknown of how the other Western Conference playoff races will shake out. Memphis and Denver are tied at 51-24, and the loser of that race likely will slide to the no. 5 spot, with the Clippers (50-26) locked into a top-four seed by virtue of a stupid NBA rule that guarantees a top-four seed to any division winner. If the Grizz are locked into their seeding by the final game, they may rest key players; they’ve already been limiting Zach Randolph’s minutes, and Marc Gasol is playing through an abdominal injury. Things are even trickier with the Lakers. Their final three games come at home against, in order, Golden State, San Antonio, and Houston. All three of those teams are currently battling for playoff seeding — the Spurs with Oklahoma City for the top spot in the West, and the Warriors and Rockets with each other for the no. 6 spot. The Jazz will be rooting for all those races to remain competitive up to the very last day. In simpler terms: If Utah can sweep its three games against lottery teams (one against New Orleans and two against Minnesota) and snag just one win against a playoff club, it’ll finish 4-2 in its last six and 43-39 overall. The Lakers would have to go 5-2 in their final seven games, starting at home tomorrow night against Memphis, to finish with 44 wins and make the playoffs. That’s a tall order. Playoff systems that give Utah even odds see a good chance for that 4-2 finish; those that favor the Lakers think 3-3 is more likely. That one game might mean everything. The Jazz had won five straight before falling apart against Denver last night, and it’s tempting to chalk up that five-game streak to a soft schedule. Four of those games came at home, where Utah is 28-10, and two came against teams playing the dreaded second game of a back-to-back in Utah’s mile-high altitude. The lone playoff team in that stretch, the Nets, are a below-average defensive team, and the Jazz predictably shredded them. The Jazz also nailed better than 40 percent of their 3s in that stretch, a random blip from a franchise that has historically been afraid of the extra point a 3-point shot provides. In most cases like this, we should give the Jazz a golf clap for winning games they should win, and move on to something else. But Utah has subtly changed its offensive process, starting a few games before that five-game win streak. And those changes helped Utah work its way out of a nasty offensive slump. The Jazz were a top-10 offense last season and for most of this season, but from about mid-February through mid-March, they weirdly fell off, scoring at a bottom-10 rate. A team that defends like the Jazz cannot survive scoring at a bottom-10 rate. Utah’s post-heavy offense had become slow and predictable; Al Jefferson, the fulcrum of that offense, went into a slump, and the Jazz didn’t feature enough variety to keep things afloat when Big Al’s game went off the rails. The offense has picked up again since, thanks to several changes: the return and reintegration of Mo Williams; Ty Corbin’s decision to start Gordon Hayward; and Corbin’s move to add some spice to Utah’s base offense. That has mostly come by mixing in more pick-and-rolls, and especially more Hayward pick-and-rolls on the side of the floor. For the season, about 29 percent of possessions that Hayward has finished with a shot, drawn foul, or turnover came via pick-and-rolls where Hayward either shot or passed, per Synergy sports. In the 10 games before last night’s Denver loss, that number shot up to 44 percent, and Utah scored very efficiently — better than 1.02 points per possession — on those Hayward pick-and-roll plays, per Synergy. Williams has been running pick-and-rolls at his normal rate since his return, but those plays of course vanished during his prolonged absence due to a thumb injury. The changes are reflected in Utah’s overall offensive numbers in that 10-game stretch, and especially in Jefferson’s numbers. About 16 percent of Utah’s possessions for the season have finished with a post-up play, per Synergy, the second-highest such share in the league, behind only the behemoth Pacers. That number is down to 12 percent of late, and if you dig deeper, you see Utah has redistributed those post possessions to pick-and-rolls and a huge jump in plays Synergy simply classifies as “cuts.” And if you dig even deeper and watch the tape, you’ll find most of those “cuts” — efficient looks Utah is snagging at a league-best rate during the last three weeks — come out of pick-and-rolls. The pick-and-roll “cut” baskets mostly fall into one basic category: Hayward or Williams will run a pick-and-roll on the side with Paul Millsap, the opposing defense will send its other big man (guarding Jefferson) to help on that side of the floor, and either Millsap or Hayward/Williams will hit Jefferson for an easy bucket. In other words: These pick-and-rolls are producing wide-open looks at the rim for the big man not directly involved in the play. Hayward and Millsap have just run a quick pick-and-roll on the left side, and Millsap’s man (Reggie Evans) has left Millsap to help Gerald Wallace corral Hayward. 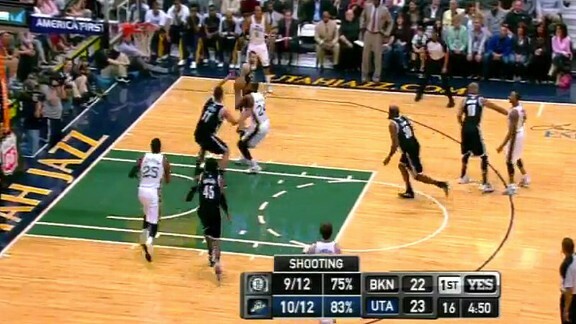 That has left Millsap open, and Hayward is in the process of hitting Millsap with the easiest available pass. Brook Lopez, guarding Jefferson under the rim, is about to slide out onto Millsap, with the hope that a weakside help defender will crash down on Jefferson. I don’t have the video available, but Millsap is about about to catch Hayward’s pass and hit Jefferson for an easy layup before a Brooklyn defender locates Jefferson. Nearly 59 percent of Jefferson’s baskets came via an assist during that 10-game stretch pre-Denver, and a whopping 62 percent came via dimes during the five-game Utah winning streak Denver destroyed last night. That’s up from a 54 percent figure for the season, per NBA.com. Millsap or Hayward have assisted on 62 of Jefferson’s baskets this season; 18 of those assisted baskets — nearly one-third of them — came during that 10-game stretch. Jefferson shot at least 50 percent in six consecutive games, earning Western Conference Player of the Week honors, and the Jazz piled up points in that stretch at a rate just below what the league’s two best offenses (Miami and Oklahoma City) have averaged for the season, per NBA.com. I’ve hit Corbin, who declined to comment for this story, hard this season for shaky rotations and an incoherent defensive scheme. But he deserves a lot of credit for making these late-season adjustments, tightening Utah’s rotation a bit, and generally getting a ton of outgoing free agents to play with a team-first mentality. None of that stuff is easy, though Enes Kanter’s shoulder injury cleaned up the big-man rotation by default. Serious contenders usually don’t play four big men heavy rotation minutes, according to a study I did last summer when Chicago let Omer Asik walk in free agency. And Corbin has adjusted his defense of late, too. I pointed out last month that Utah was having its bigs jump out hard on pick-and-rolls, even though Jefferson especially isn’t very good at that, lacking the foot speed and general awareness to run out beyond the 3-point arc and recover in time. That’s happening much less of late. Corbin has Jefferson (and Millsap) either dropping back toward the foul line or sliding laterally on pick-and-rolls, a strategy that might make it easier for them to contain opposing point guards while keeping them closer to the paint. Unfortunately, it hasn’t worked. The Jazz, even in that happy 10-game stretch, allowed 104.8 points per 100 possessions, almost exactly equivalent to their season-long mark, which is the ninth-worst in the league, per NBA.com. That number was even worse during the five-game win streak. Bottom line: This team just can’t defend, regardless of their strategy, and especially when both Jefferson and Williams are on the floor. Those are two very bad defenders at very important positions, and it would be difficult for any coach to build a top-10 defense around them. Of course, coaches control playing time and rotations, and construct overall schemes, and Utah has never had the five-man-on-a-string unity of the league’s better defenses. The Nuggets picked Utah apart last night on very simple plays, often leaving the Jazz looking strangely baffled. Let’s review: Williams goes under the screen and falls behind the play. Jefferson drops back, as discussed above, but leaves just a beat too early (though Williams has made his job very difficult), allowing Prof. Andre Miller, PhD, to turn the corner. And finally, once behind the play, Jefferson simply stands around, allowing Kosta Koufos, the original screener and Jefferson’s man, to trot in for an uncontested putback. Utah just hasn’t been good enough defensively in the last two seasons to be taken seriously as a playoff threat. That remains the case, even with San Antonio, still holding the no. 1 spot ahead of a monster matchup tonight against Oklahoma City, potentially missing Manu Ginobili for some or all of its first-round series. Corbin and Utah’s players, especially Hayward, deserve praise for Utah’s resurgent offense, and that offense gives the Jazz a fighting chance in any game against a top team; they took San Antonio to overtime just two weeks ago, after all. That offense also has kept Utah in the thick of a playoff race that looked only 10 days ago as if it might come down to the Mavericks and the Lakers. The Jazz have righted themselves, but only on one end of the floor. Until they figure out the other end, their ceiling remains woefully low.